fixed. The masses of string and springs are negligible. How the time period of oscillation of both blocks are same. In this force in both springs would be always same . That is kx$_1$ =2kx$_2$ . Have you written and solved the equations of motion? Do you think periods will be the same or different for the 2 masses? Why? Don't know how to write equation of motion in spring. The question states that the pulley is frictionless and fixed but not that it is massless. I think the latter (fixed) must be a mistake : the pulley must be free to rotate, in order to get the result that the blocks have the same period. We must also assume that the pulley is massless. Then tension in the string and springs is always the same on both sides of the pulley, as is the case when there is string but no springs. The masses are equal and the tensions acting on them are equal, so the acceleration must also be equal : $m\ddot x=mg-T$ (taking down as +ve for both masses). Both masses have the same equation of motion, so the oscillation frequency and period is the same. However, this is incorrect. It assumes that the upper ends of the springs are fixed in position. They are not. The pulley turns freely. Then some of the larger extension of spring 1 is transferred smoothly and instantaneously to the other side, compensating for the smaller extension of spring 2. Therefore the extension of spring 1 is not equal to the displacement of mass 1, and likewise for spring 2/mass 2. The masses are released at the same time, and the above mechanism keeps the lower ends of the springs always level, where the masses are attached. So the masses oscillate in phase. 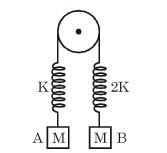 Can we say bot the springs have same acceleration at any instant ,so the time period is also same . The accelerations of the *blocks* are the same, therefore their periods are the same. Different parts of the springs accelerate at different rates, because they expand.